I have this thing with cheesecake. I really like it, but West Michigan isn’t exactly teeming with cheesecake restaurants. I had to run a few errands before heading to work on Saturday that took me down 28th Street near the Woodland Mall in Kentwood. There are a number of dining options in the area including almost any chain your heart desires. 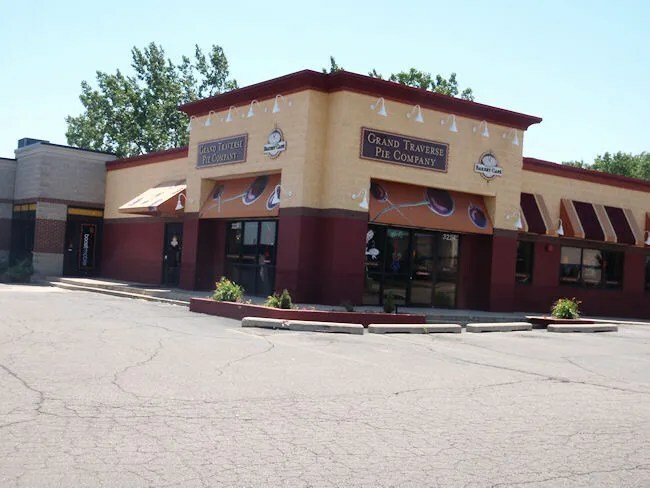 When J and I lived in Lansing, I could always get my cheesecake fix at the Grand Traverse Pie Company. There were two locations in the Lansing area (there are three now). One in East Lansing and one in Okemos. 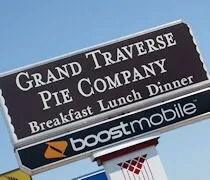 Statewide, there are sixteen Grand Traverse Pie Company locations with the Kentwood location being the most convenient one for me now. The restaurant is on 28th Street directly across the street from the Woodland Mall Entrance. It shares a building with a couple other businesses, but GTPC is right out front. The large parking lot was fairly empty, but it was almost 3:00 before I headed in for lunch. You are immediately assaulted with pie as soon as you walk in the door. There’s also a refrigerator case steps inside the door with the cheesecake I was looking for. After grabbing a slice, I headed to the cash register. I was also in the market for a sandwich, so I looked over the sandwich menu hanging behind the counter while the cashier heated up a couple pieces of pie for a customer in front of me. The sandwich that jumped out at me was on the Specialty Grilled Sandwiches section. 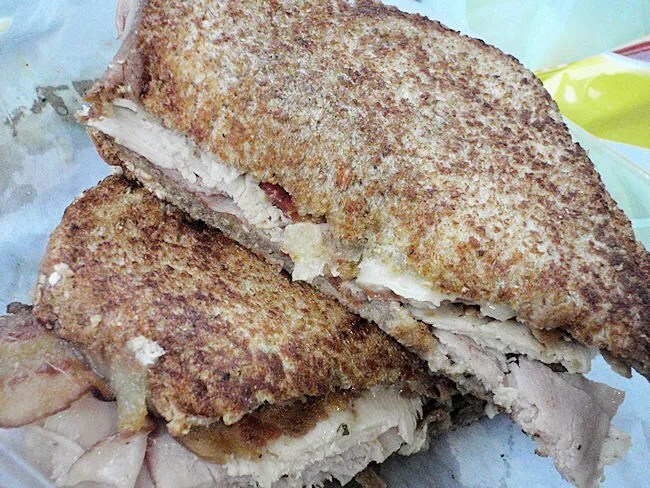 It’s called The Manitou and it comes with turkey, ham, bacon, Swiss cheese, salt, pepper, and pesto mayo on whole wheat. The cafe is set up somewhat like a Panera in that you order, give them a name, then wait for your sandwich to be made in the small kitchen with a panini press visible from the dining room. The charge was a little over $11 for the sandwich, a bag of chips, a pickle spear, and a slice of cheesecake. The wait for my sandwich was less than ten minutes. The surprising thing here is I didn’t ask to leave the mayo off…mainly because I didn’t even know it was there. It wasn’t listed on the menus hanging in the store and there were no paper menus anywhere that I could see. Instead of getting upset about it, I just picked the sandwich up and stuck it in my mouth. I know I’m anti-mayo on anything, but I actually don’t mind it in small quantities. The problem with every restaurant (yes, I’m lumping ALL restaurants together) is that they put gallons of the crap on everything. Sometimes I think I’m eating a mayo sandwich instead of a turkey sandwich. That was not the case with this sandwich. The pesto mayo actually was pretty light and added just a slight tang to compliment the salty bacon. There was more ham and turkey than I expected on a deli sandwich and it came on a perfectly toasted wheat bread. I couldn’t eat the cheesecake in the car because I didn’t grab a fork at the restaurant. I waited until I got back to work and made my co-workers very jealous. 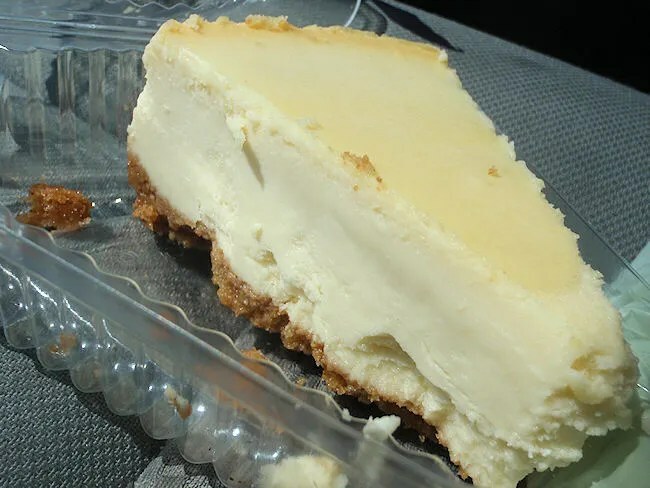 The slice of cheesecake was deliciously smooth and creamy with a thin cracker crumb base. Exactly what I was craving. Grand Traverse Pie Company isn’t a place you would expect to find me. I don’t really eat pie (yes, I’m weird…I know) and my first choice for a meal is usually a burger. I do have a sweet tooth that craves cheesecake and G.T. Pie is one place I know I can get a good slice….as well as a tasty sandwich.